With spring starting to show its colours, many creatures are making some dramatic appearances in the Park – eagles and herons nesting, hummingbirds buzzing. Others have always been there, their fascinating characteristics hidden from view. Consider these delicate tendrils, emerging kraken-like from this tiny opening. Part of a barnacle, this fan of tendrils is its jointed legs, or cirri. Only these legs aren’t for walking. 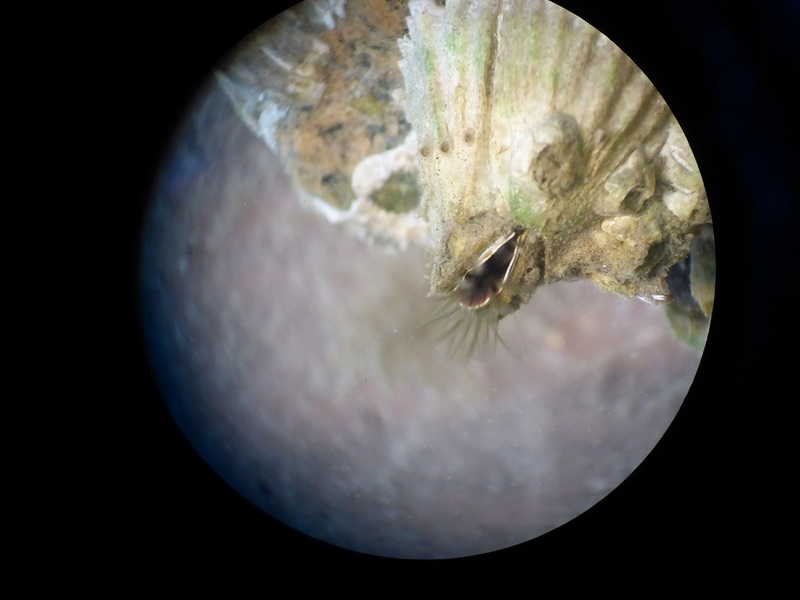 Barnacles use their cirri to fan through the water for plankton. With fast, sweeping movements, the cirri scoop through the water, catching and directing plankton down towards their mouths to eat. So fast it can be just a blur on camera! These common acorn barnacles are anchored to one place for their entire lives (8-10 years! ), so they rely heavily on their cirri to be able to survive. 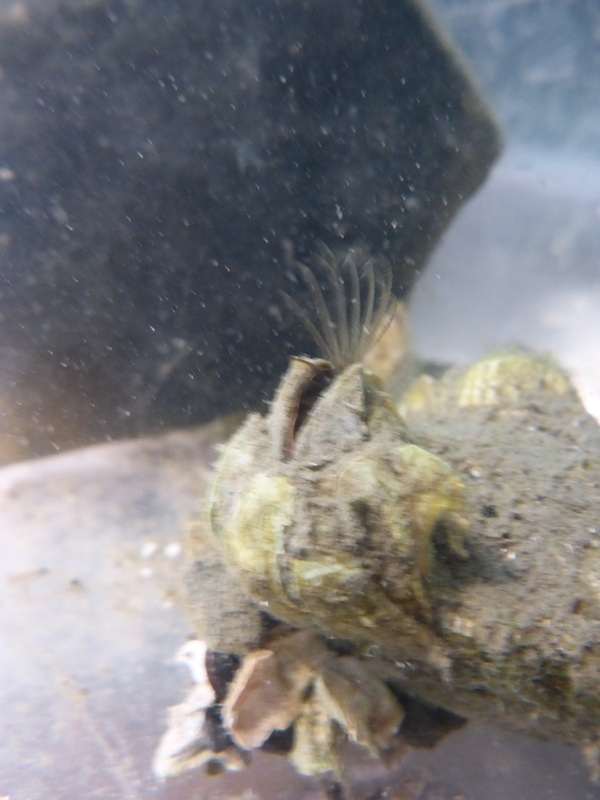 When barnacles sense the water moving, that’s when they’ll open their plates and extend their cirri to start feeding. Here in the Park we experience our most extreme low tides in the spring season, so now’s the perfect time to get out and explore the intertidal zone. Take a walk out onto any beach around the Park, and barnacles will likely be among the first organism you come across. Look closely in a tide pool and you may see the tiny cirri madly sweeping the water for food. But make sure to leave any barnacles you investigate on the beach! 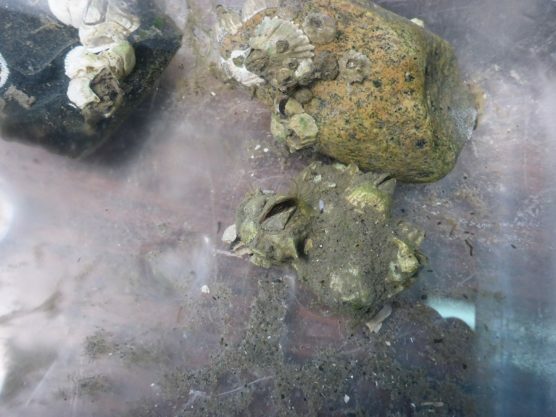 While their hard plates protect their bodies from getting dried out during low tide, barnacles are relying on that tide to come back in so they can open up and start feeding once again. These common acorn barnacles were found on the beach near the Rowing Club in Stanley Park.